Figure 8-31. - Pulling and pushing travel angle techniques. When the torch is ahead of the weld, it is known as pulling (or dragging) the weld. When the torch is behind the weld, it is referred to as pushing the metal (fig. 8-31). 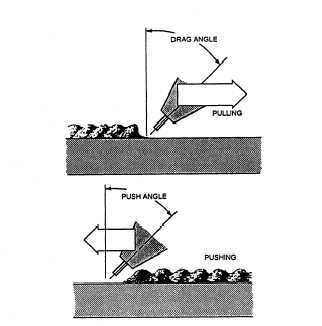 The pulling or drag technique is for heavy-gauge metals. Usually the drag technique produces greater penetration than the pushing technique. Also, since the welder can see the weld crater more easily, better quality welds can consistently be made. The pushing technique is normally used for light-gauge metals. Welds made with this technique are less penetrating and wider because the welding speed is faster. For the best results, you should position the weldment in the flat position. 'This position improves the molten metal flow, bead contour, and gives better shielding gas protection. After you have learned to weld in the flat position, you should be able to use your acquired skill and knowledge to weld out of position. These positions include horizontal, vertical-up, vertical-down, and overhead welds. The only difference in welding out of position from the fiat position is a 10-percent reduction in amperage. When welding heavier thicknesses of metal with the GMA welding process, you should use the multipass technique (discussed in chapter 3). This is accomplished by overlapping single small beads or making larger beads, using the weaving technique. Various multipass welding sequences are shown in figure 8-32. The numbers refer to the sequences in which you make the passes. Once you get the feel of welding with GMA equipment, you will probably find that the techniques are less difficult to master than many of the other welding processes; however, as with any other welding process, GMA welding does have some pitfalls. To produce good quality welds, you must learn to recognize and correct possible welding defects. The following are a few of the more common defects you may encounter along with corrective actions that you can take. Figure 8-32. - Multipass welding.